Hyundai Genesis captures the 2009 Canadian Car of the Year award. 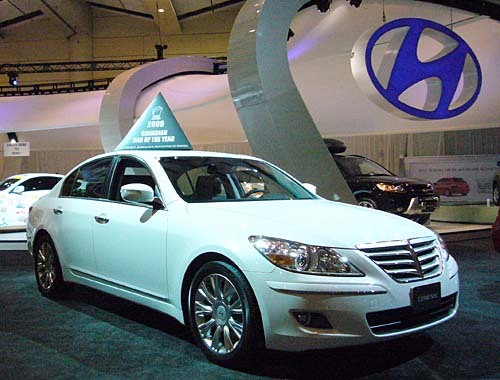 The Hyundai Genesis was named the 2009 Canadian Car of the Year at the Canadian International Auto Show held in Toronto on February 11, 2009. The Genesis was the winner of the luxury car segment during the Testfest competition held by Automobile Journalists Association of Canada (AJAC). The vehicle submitted for testing was the V8 equipped model which lists for C$42,995, including the technology package. The Genesis is the only model Hyundai manufactures with a V8 engine option. A V6 model is also available which starts C$37,995.